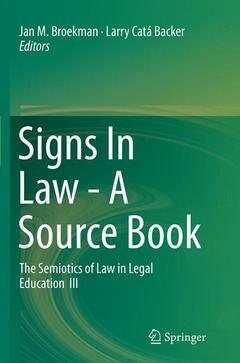 This volume provides a critical roadmap through the major historical sources of legal semiotics as we know them today. The history of legal semiotics, now at least a century old, has never been written (a non-event itself pregnant with semiotic possibility). As a consequence, its sources are seldom clearly exposed and, as word, object and meaning change, are sometimes lost. They reach from an English translation of the 1916 inaugural lecture of the first Chair in Legal Significs at the Amsterdam University, via mid 20th century studies on “property” or “contract,” to equally fascinating essays on contemporary semiotic problems produced by former students of the Roberta Kevelson Semiotics Roundtable Seminar at Penn State University 2012 and 2013. Together, the materials in this book weave the fabric of semiotics and significs, two names for the unfolding of semiotics in law and legal discourse at least until the second half of the 20th century, and both of which covered a lawyer’s focus on sign and meaning in law. The latter is embedded within the cultural imperatives of the civilization that gave these terms meaning and made them an effective tool for the dissection of law, its reconstitution as an instrument to be used by the lawyer to advance the interests of her clients, and for judges as a means to restructure language as a narrative of law whose power could bend behavior to its strictures. Legal semiotics has become an indispensible part of the elite lawyer’s toolkit and a fundamental approach to analysis of legal texts. Two previous volumes published in 2011 and 2012 explored the conceptual, methodological and epistemological progress in the field of legal semiotics, the modern forms of semiotics study, and the mechanics of meaning making processes by lawyers. Yet the great lessons of semiotics requires a focus on the origins of the concepts and frameworks that would become contemporary legal semiotics, its origins as an object of the consciousness of meaning making—one whose roots, as lessons for the oracular conversations of law, are expanded in this volume. Preface.- Acknowledged Sources.- 1. Introduction Reading Semiotics, Jan M. Broekman and Larry Catà Backer.- 2. Eco and the Text of the Communist Manifesto, Jan M. Broekman and Larry Catà Backer.- Part I From Legal Significs to Legal Semiotics.- 3. Origins and Effects of Legal Significs, Jan M. Broekman and Larry Catà Backer.- 4. “Word-Value” and “The ‘I’, Frederik van Eeden.- 5. “Significs” and “Significs and Philosophy”, Gerrit Mannoury.- 6. “What is Significs?”, Lady Victoria Welby.- 7. Editorial 1: J.I. de Haan, the First Legal Semiotician.- 8. Essence and Task of Legal Significs, Jacob Israël de Haan.- 9. Legal Significs and its Application in the Terms ‘Liable’, ‘Responsible’ and ‘Accountable’, Jacob Israël de Haan.- Part II Godfathers of Semiotics—Welby, Peirce, Greimas, Lacan.- 10. Editorial 2: ‘Meaning’ and the Welby-Peirce Correspondence.- 11.Meaning, Lady Victoria Welby.- 12. Two Letters to Lady V. Welby: Oct. 12, 1904 and Dec. 24/25 and 28, 1908, Ch. S. Peirce.- 13. Editorial 3: Firstness, Shock, and Signs.- 14. Firstness, Shock, Law, and The Hand of the Sheriff, Ch. S. Peirce.- 15. Editorial 4: Layered Discourses, Dynamic Semiotics.- 16. A View On A. J. Greimas’s Essay “The Semiotic Analysis of A Legal Discourse: Commercial Laws That Govern Companies and Groups of Companies”Larry Catà Backer.- 17. Editorial 5: I and Self (Welby, Lacan).- 18. Lacan, The Mirror and the “I”, Jan M. Broekman.- Part III Semiotics of Law Today.- 19. Justinian Corpus Iuris Civilis (Fragment).- 20. Editorial 6: On Persons, Things and Obligations in Semiotic Perspective.- 21. Fundamental Concepts of Roman Law, Max Radin.- 22. Family as a Commonsensical Device and its Place in Law, Tracey Summerfield and Alec McHoul.- 23. The Multiple Faces of a Corporation’s Legal Personality, Larry Catà Backer.- 24. Property: The Legal ‘Thing’ as Artwork, Roberta Kevelson.- 25. Place, Space, and Time in the Sign of Property, Robin P. Malloy.- 26. The Ethics of Property: A semiotic Inquiry Into Ownership, Denis J. Brion.- 27. Quid pro quo: Contractual Semiosis and Translation, Dinda L. Gorlée.- 28. The Semiotics of International Law: Interpretation of the ABM Treaty, R.W.Benson.- 29. Cultural Immersion, Difference and Categories in US Comparative Law: Conclusions, Vivian Grosswald Curran.- Part IV Developing Semiotic Awareness.- 30. Law in Signification Processes, Jan M. Broekman and Larry Catà Backer.- 31. Editorial 7: From Prize-Winning Seminar Papers to a General Conclusion.- 32. Can Words Really Set A Man Free? A Semiotic Analysis of the American Criminal Defendant’s Right to Allocution, Charles Volkert.- 33. Shareholder Derivative Action and Corporate Identity in Delaware Jurisprudence, Alan C. Green.- 34. Signs Without Authority: The Battle of Experts, the Caricature of a Discourse and the Failure of Scientific Evidence, Robert Marriott.- 35. Semiotics in a New Key, Jan M. Broekman and Larry Catà Backer.- General References.- About the Authors.- Name Index.- Subject Index.